That was my most memorable church experience. I believe I was three years old at the time, and I still remember it all these years later. We were learning about the persecuted church, specifically in Russia (USSR) as I recall. That evening gave me a taste – be it ever so small – of the challenges Christians in many parts of the world have to face in order to learn more about God. It brought the real-ness of it to me, gave me a connection and settled into a special place in my heart. Years later, I discovered a set of books written for children – I like to check out books for my younger friends, as if you haven’t noticed – that take place during the final years of the USSR. Of course, I had to read them. 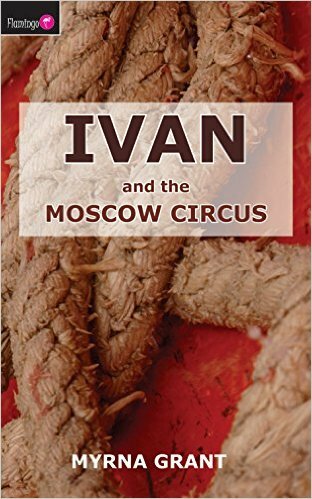 Ivan and the Moscow Circus is Book #1 in the series. There are 6 titles in all. Within the Ivan series, Myrna Grant shares the escapades of Ivan, his sister Katya and the struggles they face growing up as Christians in the USSR. Whether at the circus, in school and even in America, Ivan is faced with choices of whether to do things God’s way and invite persecution or to take the easy way out. Each book is packed with suspense, including interrogations by the police and smuggling God’s Word. While the action is gripping, the realities of life for Christians in the USSR are dealt with in a way suitable for most children (I would say ages 9+). Beyond that, I think many children today will be able to empathize with Ivan and will gain a greater understanding and compassion for the persecuted church. I wished I had read these books before my college class on the “Rise & Fall of the Soviet Union”. Frankly, stories seem so much more memorable than mere facts! Besides that, I would have had interesting pegs to hang my new knowledge on and heightened interest in the skeletal matter of Soviet history. From both the stories and the class, I came away with a deeper understanding of Russia’s history and sociology – why it is the way it is today – but the biggest take-away for me was gratitude. Gratitude for a freedom-filled history, gratitude for family, gratitude for the opportunity to work hard to benefit myself and those I love, gratitude for the ability to speak my mind, gratitude for liberty to worship God. Those who have gone before us in faithfully walking through trials whether in the USSR or elsewhere around the world. The liberties we enjoy – however great or small they are. His faithfulness (Psalm 117:2, ESV). From Prince Edward Island at the turn of twentieth the century, let’s move ahead multiple decades in “book time” and listen in on the Hunter family from near Blossom Hill Lane, USA. [Abby] stood stone still. “Something’s crazy wrong,” she whispered. “Let’s find our sisters,” Abby said. …The Hunter family huddled in the hallway. “There’s been a mistake,” Mr. Hunter explained. Have you ever been the subject of a mistake that threatened your picture of the future? Both of the above scenes come from stories about mixed-up adoptions. In the one case Anne Shirley arrives in Avonlea instead of a boy and in the second Sung Jin and Choon Koo, two Korean brothers, arrive in America instead of two expected girls. Talk about surprises! While it’s hard to imagine two boys being sent halfway around the world instead of two girls in this day and age, we all know that “mistakes” happen plenty often. Even more frequently, our realities deviate from what we picture in our heads. At least mine do. It’s no fun being the subject of a change that shakes up the pieces of our life-puzzles. Sometimes it makes us mad like Marilla at the beginning of Anne of Green Gables. Sometimes it brings hard work or dismantles work. In The Double Dabble Surprise Abby and Carly Hunter are horrified when the room they carefully gave all sorts of girly touches is boy-i-fied by their unexpected brothers. Sometimes surprising situations mean we have to surrender old dreams like Abby and Carly give up the bride bears they were going to give the new girls. Of course, not all mistakes have to be lived with. Sometimes they are opportunities to practice problem solving. Other times they’re just momentary rain showers to give us practice at putting up our umbrellas of faith (or our “faith-brellas” as I like to call them) before the sun comes out and everything’s fine. And how does it work out for the Hunters? Well, I suppose you can guess, but if you have a young reader in your home, you might just have to let them find out. Why not make it a great way to celebrate National Adoption Month (November)? Perhaps you’ll even enjoy Beverly Lewis’s entire Cul-De-Sac Kids series together! L.M. Montgomery, Anne of Green Gables (New York: Alfred A. Knopf, Inc., 1995), 36 An Everyman’s Library children’s classic edition. Beverly Lewis, The Double Dabble Surprise, The Cul-De-Sac Kids, 1 (Minneapolis: Bethany House, 1995. ), 16-18. L.M. Montgomery, Anne of Green Gables (New York: Alfred A. Knopf, Inc., 1995), 356. An Everyman’s Library children’s classic edition.